I decided to jumpstart my day with an appropriate Fourth of July breakfast: a red, white and blue omelet. It’s kinda like a fruity pancake, in a way. First, let me explain that this is not a savory omelet, but a sweeter one rather. 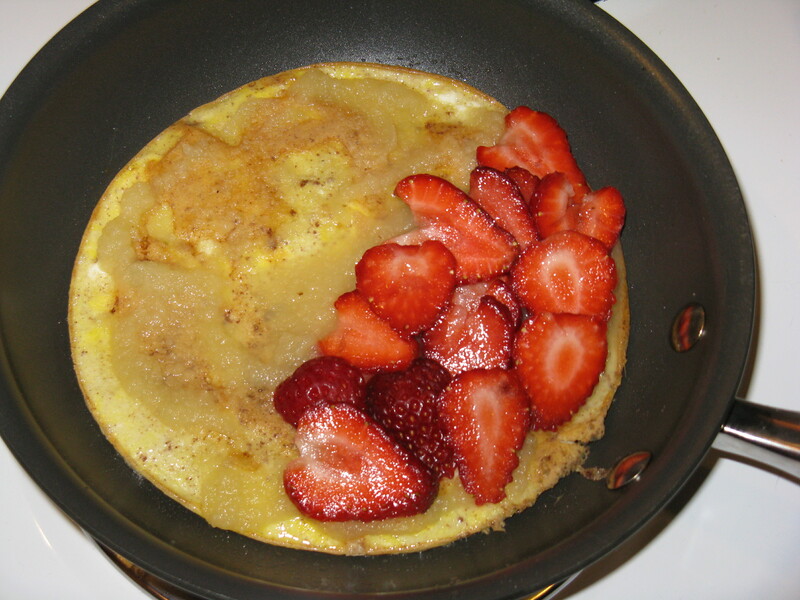 I was inspired by Paleo Magazine’s, Strawberry Applesauce Omelet recipe, but added an Independence Day twist to it. I ate mine with two of Applegate Naturals’ chicken apple sausages. See my take on the recipe below. Enjoy and happy Fourth of July! Melt ghee in heated skillet. Meanwhile, beat together eggs, cinnamon and vanilla. Pour egg mixture into skillet. Cook until mostly set, then flip. 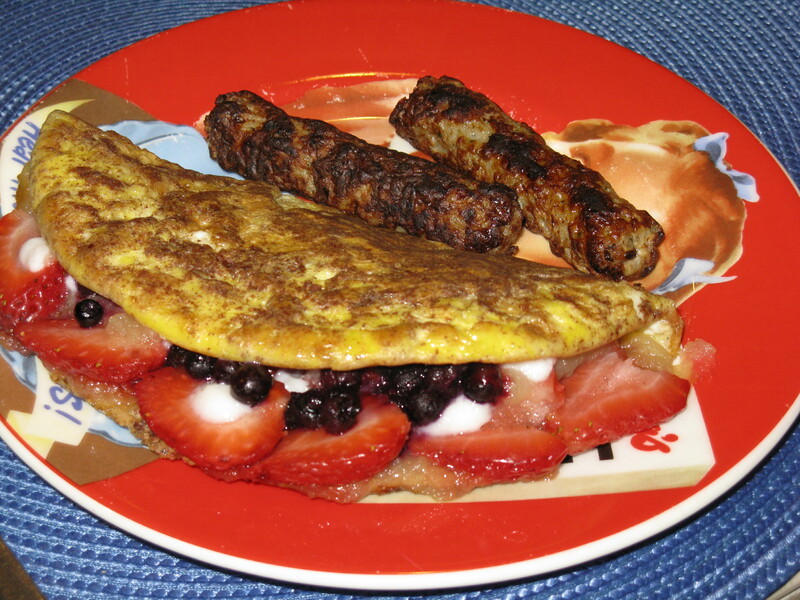 Spread the applesauce, strawberries and blueberries over half the omelet. Drizzle on the honey, if using and coconut butter. Fold in half and slide onto a plate. Oh my God, that omelette looks amazing. I’m thinking the toppings would go well with some coconut flour pancakes as well? So many ideas! And also, i am 100% jealous that you have a paleo food cart so close to you! I don’t think a semi-paleo friendly restaurant, much less food cart, exists less than three states away from me! It was tasty! I realized it was basically like eating the batter mixture for french toast plus the fruit. Yes, these toppings would definitely go well with coconut flour pancakes too! The possibilities really are endless, and it’s so much fun. Yep, they’re delicious any time, and you can always switch up the fruit too. Peaches, banana, or blackberries would be spectacular!